Beginning in the 1700s, Georgetown was the economic and social center for the area that would later become our nation's capital. Many different groups and characters have cycled through this small town, all of whom left their marks with buildings, homes and churches. On this 2-hour walking tour, you'll weave you through the mysteries and legends with your guide who will provide you with a sense of the history of this still thriving port town. See homes once owned by the Kennedy and Lincoln families, the Old Stone House, Georgetown University, and Tudor Place Mansion. 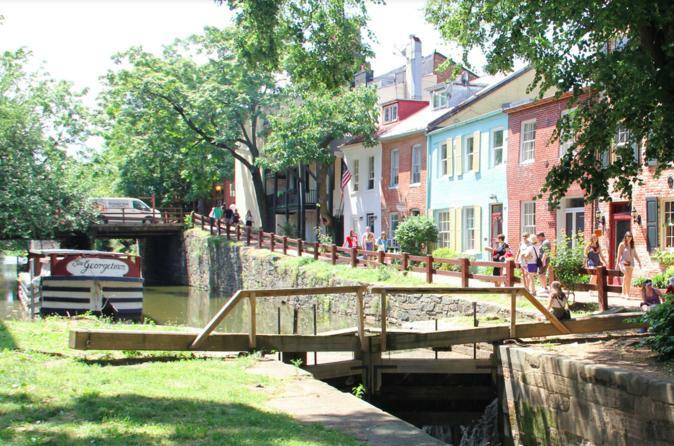 After meeting your guide at the Georgetown Waterfront Park at the corner of 31st and K St NW, at 2pm, you'll begin a walking tour of historic Georgetown which will include stops outside of many historic homes in Georgetown. See homes previously inhabited by the Kennedys, Lincolns and many other prominent families. Each stop includes about 5 to 10 minutes of narration and an examination of some of the architectural styles of the buildings. There will be plenty of opportunity for avid photographers to document the sites. Some of the specific houses you'll see are the Old Stone House, Martin’s Tavern, Georgetown University and Tudor Place Mansion. The tour will end at Georgetown University, around 37th and O St NW at around 4pm.